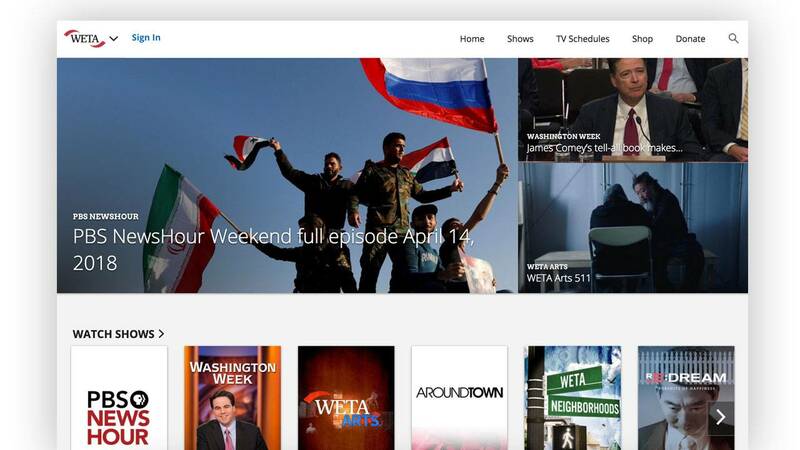 PBS Digital is launching the redesigned station video portal. With this launch, the station video portal is being updated to make use of the Core Data Model, taking advantage of improved metadata structure and the UX improvements it provides. This update is part of a larger rollout of improved video experiences using the Core Data Model, with members of the Digital Media Advisory Council (DMAC) discussing, reviewing, and providing feedback to our designers and developers. PBS.org and the legacy Apple TV app previously received updates to benefit from Core Data Model. Stations that have organized their videos in Media Manager in seasonal and episodic order will now see the distinction on the redesigned station video portal. Improved search results based on content organized as described above. Collections, Specials, and Extras will display in the appropriate categories. Stations will also begin to see their related content (like the Learn More links) on video pages. The local station Shows are controlled with the Video Landing Local Videos feature in Curate. The newly designed carousel can hold up to three video images per slide, with up to five slides. It currently pulls full-length videos from the Station Video Portal Carousel section in Curate. For Passport-enabled stations, the redesigned portal contains a new curated list: PBS Passport Videos This is being curated by PBS’s Content team and is designed to promote Passport awareness and viewership. Since this is the first iteration, we look forward to hearing from, and working with, any station that has input on features and functionality as part of both the front-end experience and the back-end admin. Please keep an eye out for opportunities to test and provide feedback on future builds, as well as upcoming webinars for Media Manager and Curate. Please file a support ticket if you don't have a local video portal. If you want to learn how to use the portal most effectively, please contact the Station Products & Innovation Team: spi@pbs.org. UPDATE: Apr 23, 2018 at 12:23 pm Beginning Monday, 4/23, the upgraded Station Video will resume rollout, this time as a phased launch over the course of four days. The phased launch will allow us to monitor the system and make corrections as needed, or perform a rollback. Roughly forty stations will launch each day beginning at 9am ET. Barring unforeseen problems all stations will be launched by Thursday, 4/26. UPDATE: Apr 18, 2018 at 11:55 am After rollout this morning, an issue surfaced that had not occurred during our previous testing that caused some portals to not load properly. Due to these loading errors, we are rolling back the launch of the updated station portals to perform more testing and debugging through the rest of the week. We will send out another email when the newly redesigned Station Video Portal is ready to launch.